A new, lightweight composite material for energy storage in flexible electronics, electric vehicles and aerospace applications has been experimentally shown to store energy at operating temperatures well above current commercial polymers, according to a team of Penn State scientists. This polymer-based, ultrathin material can be produced using techniques already used in industry. "This is part of a series of work we have done in our lab on high-temperature dielectrics for use in capacitors," said Qing Wang, professor of materials science and engineering, Penn State. 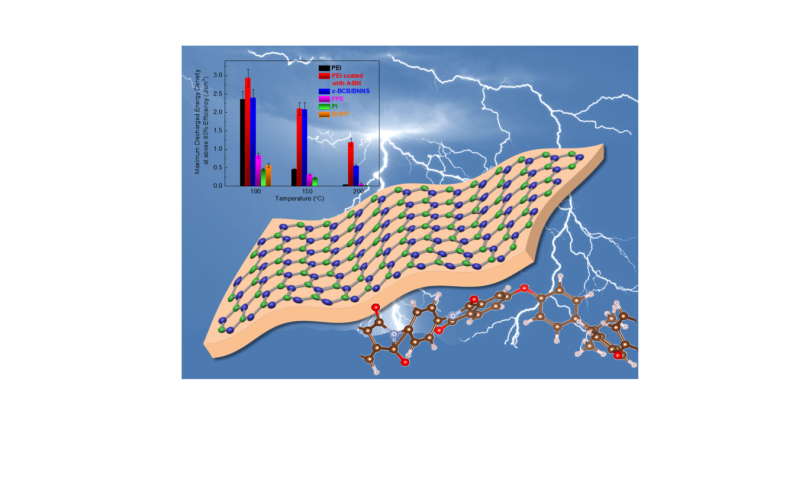 "Prior to this work we had developed a composite of boron nitride nanosheets and dielectric polymers, but realized there were significant problems with scaling that material up economically." Scalability—or making advanced materials in commercially relevant amounts for devices—has been the defining challenge for many of the new, two-dimensional materials being developed in academic labs. "From a soft materials perspective, 2D materials are fascinating, but how to mass produce them is a question," Wang said. "Plus, being able to combine them with polymeric materials is a key feature for future flexible electronics applications and electronic devices." To solve this problem, Wang's lab collaborated with a group at Penn State working in two-dimensional crystals. "This work was conceived in conversations between my graduate student, Amin Azizi, and Dr. Wang's graduate student, Matthew Gadinski," said Nasim Alem, assistant professor of materials science and engineering and a faculty member in Penn State's Center for 2-Dimensional and Layered Materials. "This is the first robust experiment in which a soft polymeric material and a hard 2D crystalline material have come together to create a functional dielectric device." Azizi, now a post-doctoral fellow at University of California—Berkeley, and Gadinski, now a senior engineer at DOW Chemical, developed a technique using chemical vapor deposition to make multilayer, hexagonal boron-nitride nanocrystal films and transfer the films to both sides of a polyetherimide (PEI) film. They next bonded the films together using pressure into a three-layer sandwich structure. In a result that was surprising to the researchers, pressure alone, without any chemical bonding, was enough to make a free-standing film strong enough to potentially be manufactured in a high-throughput roll-to-roll process. The results were reported in a recent issue of the journal Advanced Materials in a paper titled "High-performance Polymers Sandwiched with Chemical Vapor Deposited Hexagonal Boron Nitrides as Scalable High-Temperature Dielectric Materials." Hexagonal boron nitride is a wide band-gap material with high mechanical strength. Its wide band gap makes it a good insulator and protects the PEI film from dielectric breakdown at high temperatures, the reason for failure in other polymer capacitors. At operating temperatures above 176 degrees Fahrenheit, the current best commercial polymers start to lose efficiency, but hexagonal-boron-nitride-coated PEI can operate at high efficiency at over 392 degrees Fahrenheit. Even at high temperatures, the coated PEI remained stable for over 55,000 charge-discharge cycles in testing. Alem added, "There are many devices made with 2D crystals at the laboratory scale, but defects make them a problem for manufacturing. With a large band-gap material like boron nitride, it does a good job despite small microstructural features that might not be ideal." First-principles calculations determined that the electron barrier, established at the interface of the PEI/hexagonal boron-nitride structure and the metal electrodes applied to the structure to deliver, current is significantly higher than typical metal electrode-dielectric polymer contacts, making it more difficult for charges from the electrode to be injected into the film. This work was done by the theoretical research group of Long-Qing Chen, Donald W. Hamer Professor of Materials Science and Engineering, professor of engineering science and mechanics, and mathematics, Penn State.